We should only wear "silver britches" in Athens. So that leaves road games for red. Richt is 19-2 in an opponent's stadium. He's not going to throw out his lucky pants to bust out red with that sort of winning percentage. Nor should he. We're 5-8 in neutral sites (Jax, SECC and Bowl) under Richt. And we're 13-16 in neutral sites since 1990. If we were going to break out the red pants, let's do it in Jacksonville when we're the road team (odd numbered years). You've probably seen these pics before, but the guys at FootballHuddle.net photoshopped Red Pants onto our guys. Not bad. Ugh, they look like high school uniforms. Stick with the classic silver, imo. I definitely like them. They are classic...just don't wear them at home. 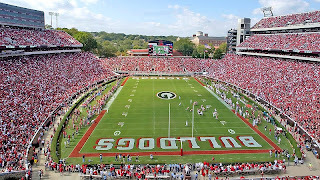 The thought of the Dawgs in red/red is almost unbearable. Love the red pants! That shot of Hershel is off the hook. Having been in school in the late 70s/early 80s, when the red pants on the road were nothing unusual, I can tell you I always liked them. Only on the road, though. The thought of Nick Jones in red jersey/red pants at home brings to mind a 350 pound blood clot. I liked the black pants when Bobo trotted them out in the post 97 bowl game, but, again, ONLY with the white jerseys. The red tops/black pants combo made us look like San Diego State, or worse, Druid Hills HS. I dont care that much about the occasional deviation from the "standard" silver pants; the extreme example of "never change a thing" is Penn State, with the most vanilla unis in the known world. On the other hand, I dont want us to turn into UT, which seems to come out in something different every week. Or, worse (if orange/orange isn't rockbottom already), Oregon, whose uniforms seem like a bad joke. They remind me of nothing so much as Mustafa's "Derelique" line in the movie Zoolander. That reminds me...maybe we should start giving Urban Meyer's stares names. Like "Orange Steel"....or "40 Ounce"....I know they're really all the same stare, but it would still be fun, and might annoy the crap out of Gators fans. Isnt that what it's really all about? Classic? Dooley did away w/ the silver britches when he came to Athens in '64 and went with the white w/ red stripe (much better than the Tennessee-esque all-white against LSU, UT, & Tech in 2000, 1-2). However, Dooley brought the silver britches back . . . in 1980, just in time to have the silver & red britches together for the title. Coincidence or not, I like what the combination produced after a long hiatus. As for now, I like the idea of wearing them for the neutral site (but only w/ white). I'll take any mojo or sartorial help we can get against the Swamp Lizards. Anything is better than the beige britches we wear now... to absolute heyall with Nike and their sh*tty uniforms and baseball bats. I like the photoshop pics. I agree about wearing them on the road...but like the idea of wearing them in Jax or at a bowl game better. Red ain't dead! Love 'em. I'd save them for a bowl game or for Jacksonville though to preserve the coolness. I don't mind the red pants. High schools wear red shirts AND red pants. Plus, the wide black and white stripe on the pants is too expensive for most high schools. More importantly, the red pants probably make it easier for the QB to find his recievers quickly on a multiple read. The home team almost always wears light colored pants and darker jerseys. I'm diggin' the red pants and have always liked them IN MODERATION. I think they should only be used for the occasional big game when perhaps a little bit of extra motivation is needed. Clemson used to don the Orange Pants for games against Georgia in the early 80's, then they started wearing them too much. That's a sign of A: a bad habit or B: a team that loses too much and needs all the help they can get. I thinks it sorta became B and diluted the effect. Red Pants: Yes...but only for the really big game. In 1976, I sent Coach Dooley a hand drawn illustration detailing how the team would look dressed out in the red helmet and white jersey combined with new RED BRITCHES for road games only. In reply, he sent me a letter that I now have framed. In that letter he assured me that my idea would receive serious consideration. The rest of the story is a small piece of UGA football history.